season’s goaltenders — Carter Hart and Mario Petit.Petersen then headed to the MJHL’s Swan Valley Stampeders. His father, Erik, is in his fourth season as the Stampeders’ general manager and head coach. Last season, Lasse played seven games with the Calgary Hitmen (3-2-0, 3.13, .879) and 18 with the Spokane Chiefs (9-5-1, 2.95, .894). 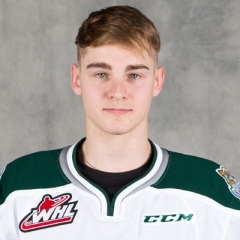 He also played in six playoff games with the Chiefs (2-4, 3.25, .893).This season, he got into one game with Everett (1-0-0, 1.00, 923).As mentioned previously here, what makes Petersen so interesting is that he is from Denmark, but isn’t considered an import by the CHL because he has dual citizenship — his father is Canadian.The CHL, of course, no longer allows its team to use import goaltenders.This is the third trade involving a goaltender made by Brent Sutter, the Rebels’ owner, general manager and head coach, since Sept. 9.That day, he traded Rylan Toth, 20, to the Seattle Thunderbirds for a third-round pick in the 2017 bantam draft.On Sept. 27, Sutter acquired G Tyson Verhelst, 19, and a conditional third-round pick in 2017 from the Spokane Chiefs for G Dawson Weatherill, 17, and a conditional fifth-rounder in 2018.Today, Sutter has four goaltenders on his roster — Verhelst, who is injured and isn’t expected to play anytime soon; veteran Trevor Martin, 20; and freshman Riley Lamb, 18. Lamb, in six games, is 3-2-1, 3.53, .904. Martin is 0-1-1, 4.14, .888.The Rebels (3-3-2) are at home to the Moose Jaw Warriors on Friday night.